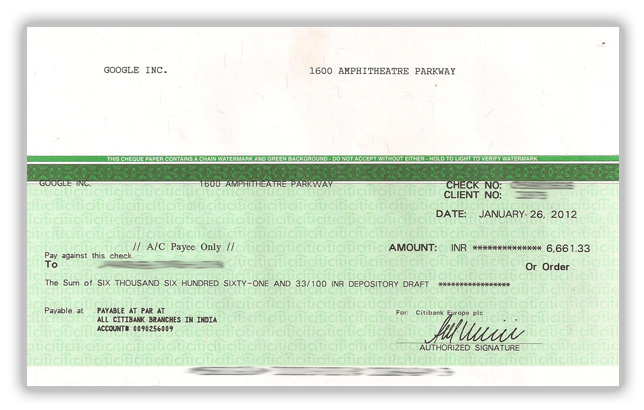 Home / Earn money online / Google Adsense / Payment Proof / How does Google Adsense Cheque Looks Like. How does Google Adsense Cheque Looks Like. Google AdSense is the most favorite monetization network for bloggers all around the world and I'm also one of them. Google AdSense is most trusted, highest paying etc. To Display AdSense Ads on your blog or website first you must be approved by Google, Getting Approved is a bit difficult for many new bloggers because the policies are very strict, I'm one of those lucky people who got it approved in the first shot but many people are not as lucky. Here is an article previously published on this blog containing Tips to Get Approved by Google for AdSense, This will help new bloggers to get approved to this awesome network. Now it's Almost 9 months and the amount certainly changed but still whenever I receive AdSense Cheques the feeling is just like the time I received my first cheque. Best of Luck to you guys and I hope you guys will receive your cheques soon. This post was just for introducing you with Google AdSense cheques. Update: Google Adsense is now also offering Wire transfers of AdSense income. Wire transfer is quick & accurate, your income, once it reaches the threshold, is directly transferred to your connected Bank account.